The VZL3530P2 is a compact pulse amplifier operating in the 1.0 to 2.0 GHz frequency range (L-band) and is specifically designed for test and measurement systems. 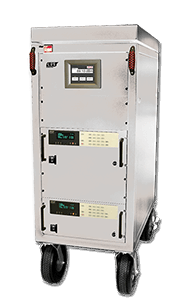 Features include a modular design for either low powered multiple test applications, or a single amplifier phase combined system of two VZL-3530P2 amplifiers achieving 7.5 kW peak-pulsed output power. This compact pulse amplifier features wideband operation, automatic fault recycle, user-friendly microprocessor-controlled logic with integrated computer interface, digital metering, and quiet operation suitable for laboratory environments. The VZL3530P2 is also designed to meet International Safety Standard EN61010, Electromagnetic Compatibility EMC 2004/108/EC, and can be applied to 230 VAC operation.